Cool herbaceous Garlic Lime Roasted Shrimp Salad… Lean and punchy, yet elegant enough to serve as a dinner party appetizer! Roasted shrimp. Fresh produce. 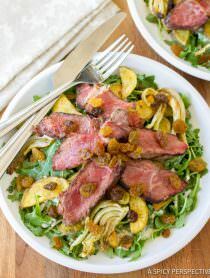 Garlic lime vinaigrette. These three things come together to make a marvelous summer salad. 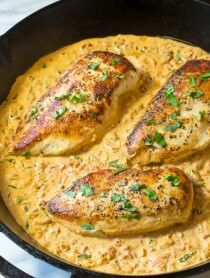 This chunky chilled sensation is a healthy and zesty first course for parties, or you can serve it as a light meal any night of the week. My family loves raw seafood salads like ceviche and poke. We eat them both all summer. However, when I’m feeding a crowd, I like to take into consideration that not everyone is comfortable eating raw seafood. This roasted shrimp salad offers the cool crisp appeal of ceviche, yet with firm perky pink cooked shrimp. 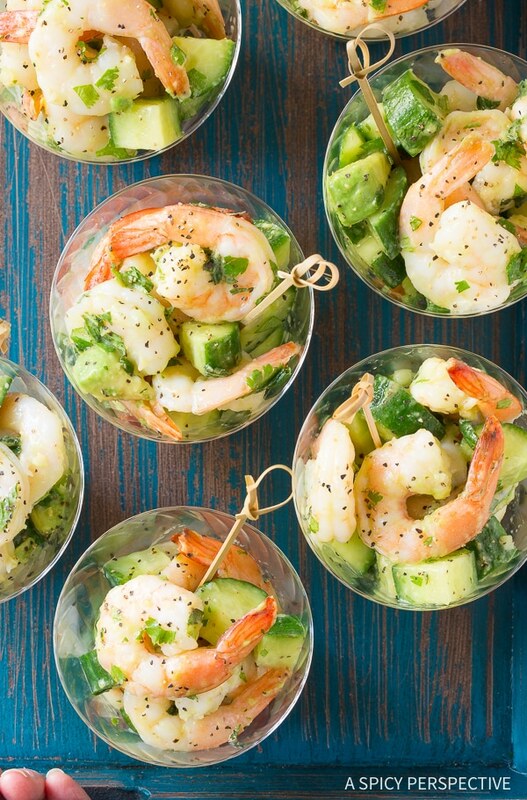 The shrimp are tossed with cucumbers, avocados, fresh mint, cilantro and a zesty dressing. 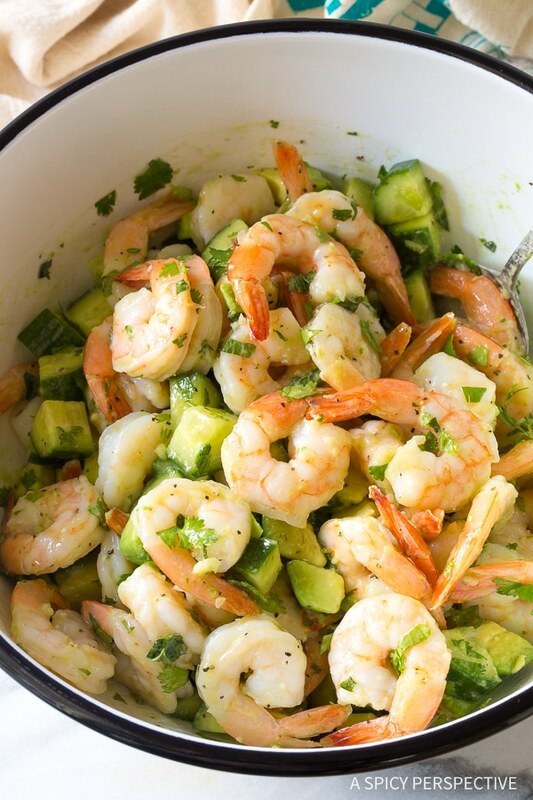 So this Garlic Lime Roasted Shrimp Salad is packed with both flavor and texture. Plus, if you use a firm avocado, instead of a soft overly-ripe avocado, you can make this salad several days ahead and it still holds up! 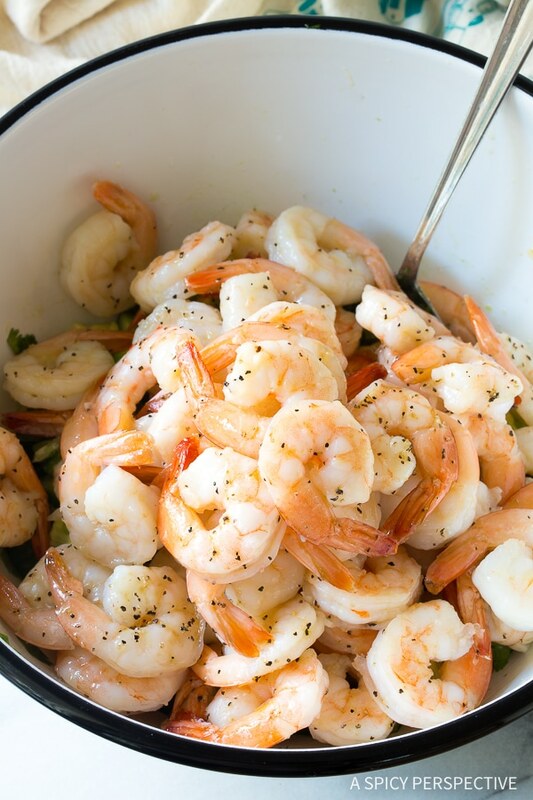 Garlic Lime Roasted Shrimp Salad is a dinner I might make on a sultry summer evening. It’s a lovely meal to eat while sitting out on the porch, watching the fireflies rise from the lawn. Pair it with a slice of ripe watermelon, and a chilled glass of white wine, for true summer perfection. 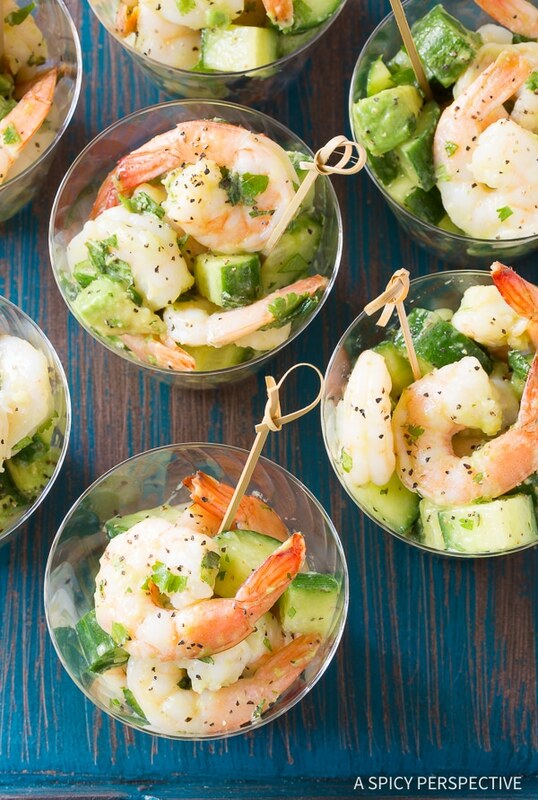 I also like to serve Garlic Lime Roasted Shrimp Salad at summer gatherings, because all the ingredients are visibly familiar, yet is tastes and feels luxurious. Scoop it into small individual cups and chill the salad until it’s time to serve your guests. Garlic Lime Roasted Shrimp Salad Recipe - This chilled seafood salad is loaded with shrimp, avocado, cucumber, fresh mint, and cilantro. It makes an easy and elegant appetizer for Spring and Summer parties! Preheat the oven to 450 degrees F. Line a large rimmed baking sheet with parchment paper. Pour the shrimp onto the baking sheet and drizzle with 1 tablespoon olive oil. Toss the shrimp in the oil and spread them out on the baking sheet. Sprinkle generously with salt and pepper. Roast the shrimp in the oven for 5-7 minutes, until pink. They should still be in the shape of C's. If they shrink to O's, you've overcooked them. Cool the shrimp on the baking sheet. Meanwhile, chop the cucumber and avocado in 3/4-inch chunks. 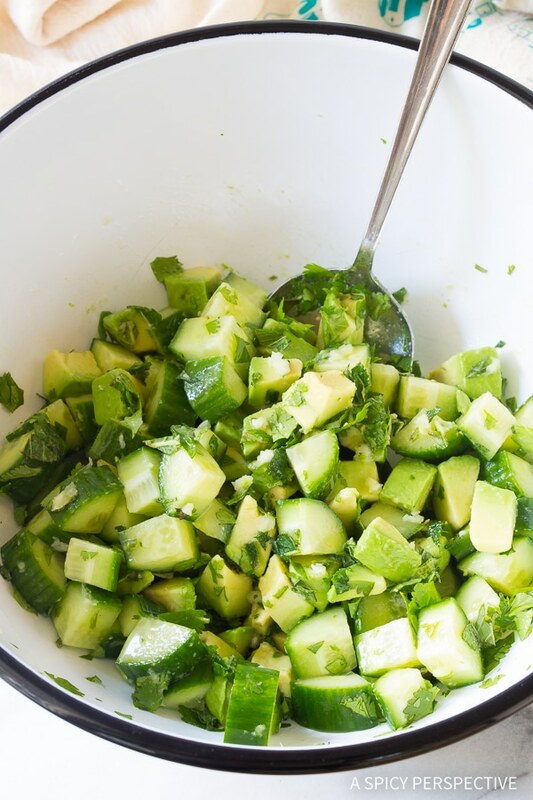 Place the cucumber, avocado, minced garlic, chopped mint leaves, and cilantro in a salad bowl. 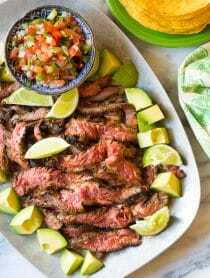 Pour the lime juice and 1 tablespoon olive oil over the salad and toss well to coat. Taste, then salt and pepper as needed. Once the shrimp have cooled to room temperature, toss them into the salad. Cover and chill until ready to serve. Serve in individual cups for an elegant presentation!